Valentine Day is around the corner. 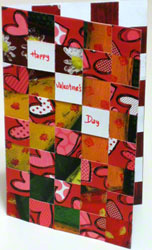 So, this season of love, make a creative valentine card that has a unique feature. What’s so unique about this love card, you might ask? It’s cut into strips and woven together. Apart from this, the weave makes it easy to juggle various words on the cover as in the gallery below. Furthermore, feel free to transform the card from portrait to landscape as in the pictures below. 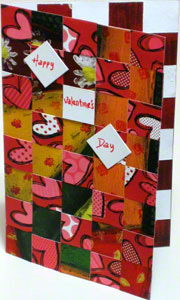 ...a cool and creative greeting card for Valentine Day. Hopefully, all the gallery choices above won’t leave you undecided. Because the fun starts when the card making begins. 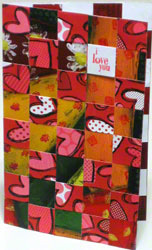 Cut the 8” x 10” abstract-art cardstock into ten 1” x 8” strips. 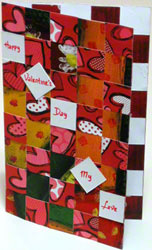 Cut the 8” x 11” heart-art cardstock paper into eight 1” x 11” strips. 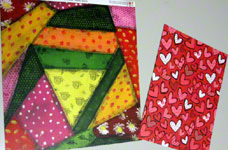 Place the horizontal heart-art cardstock strips side by side. Then, on the back, temporarily tape them down to hold them together. 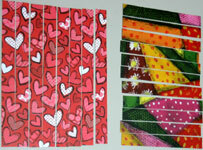 Weave these horizontal strips with the vertical abstract-art cardstock strips. 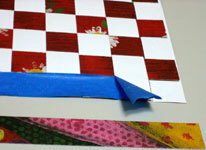 Please note that, because of the tape, the first strip will have to go last... after removing the tape. Hence, remove the tape and weave in the final strip. The excess horizontal strips should be sticking out beyond the vertical strip. 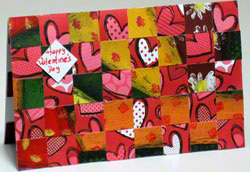 Next, cut off this horizontal excess to properly balance out the weave arrangement inside the card. 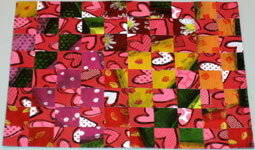 Score the woven valentine card right in the middle and fold into 5” x 8” card (approximately). 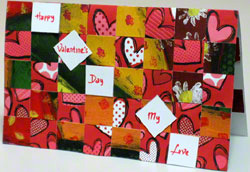 On the 1” x 1” white cardstock pieces, write out a single word on each piece to spell out Happy Valentine's Day. 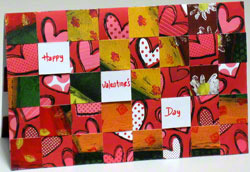 Finally, arrange the white square pieces on the card and glue them in place. Putting the tape temporarily on the strips is a very important step. Because a permanent tape could peel off the cardstock when it's time to take it off. To prevent this, run the tape a couple times on a piece of clot before using it on the card. This weakens the adhesive on the tape. Hence, turning it into a temporary tape. 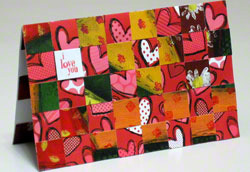 After weaving the card, the bends and spaces between the weaves extends the size of the finished card. 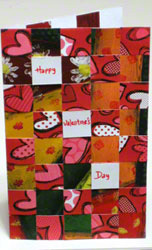 And this makes the strips too short for the greeting card. ...just like on the inside of this unique invitation card weave shown here. Want to see how the outside front cover of this other woven invitation card with non-excess strips turned out?